A real number plus an imaginary number is a complex number. Complex numbers are a number system. A complex number has a real part and an imaginary part. Complex Numbers are the intellectual ancestors of vectors. Complex numbers are convenient to apply geometric transformation (such as rotation, scaling and translation) in two dimensions. Since any complex number is specified by two real numbers one can visualize them by plotting a point with coordinates (a,b) in the plane for a complex number a + bi. 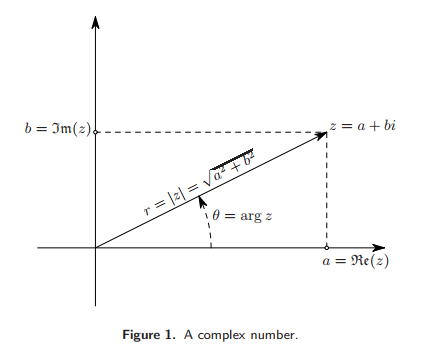 The plane in which one plot these complex numbers is called the Complex plane, or Argand plane. Length: |z| is the distance from the origin to the point z in the complex plane. and their arguments get added.